Posted in Course Related on the 20th of November 2018. 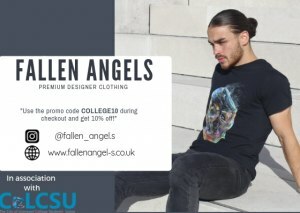 An Access to HE student at The City of Liverpool College is putting his entrepreneurial skills into practice, designing a range of clothing to sell under his own fashion label. 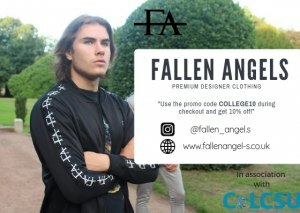 Mohammed Khalil, studying Access to Engineering, together with best mate Adam Mitchell, have created fashion brand, Fallen Angels, to bring a touch of style to urban street wear aimed at the 16-35s male market. The nineteen-year-olds decided to develop their interest in street art and start an online business after Mohammed was made redundant. They spent time researching the market, sourcing fabrics and various manufacturing processes, before creating their colourful designs with a distinct street style focus. 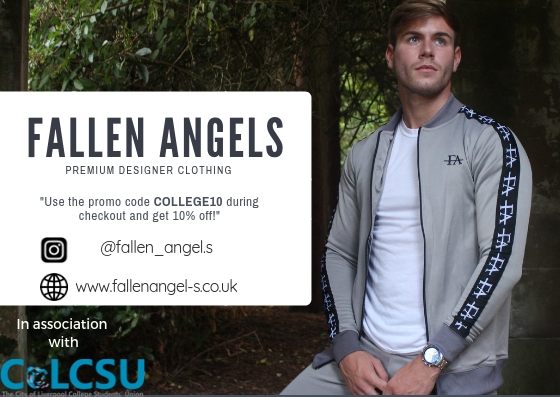 The business has grown steadily since start of trading back in May 2018, where sales have more than tripled of their branded t-shirts, track suits and fleeces, sought after by a growing number of customers from around the UK. Mohammed said: “We both look on the business as a long term plan but also knew it was important to choose the kind of business that would allow me to continue with my studies. “Not only does starting up with a partner reduce the fear-factor, it also gives you someone to bounce your ideas off, as well as someone to share the ups and downs with. The partners are already looking to expand the business locally, and are in talks with a number of clothing shops looking to stock their range of edgy clothing, including a leading fashion outlets in Liverpool’s Cavern Walks emporium. Mohammed hopes to complete his qualification at the College and move on to a degree programme in Avionic Systems at Liverpool University.